The International Boundary and Water Commission, United States and Mexico, will reduce the release of flood-waters from Falcon Dam, located at Falcon Heights, Texas-Nueva Ciudad Guerrero, Tamaulipas on July 27. Releases will be gradually reduced on July 27 from 60,000 cubic feet per second (1700 cubic meters per second) to56,600 cubic feet per second (1600 cubic meters per second). On July 28, the releases will be further reduced to 53,000 cubic feet per second (1500 cubic-meters per second). 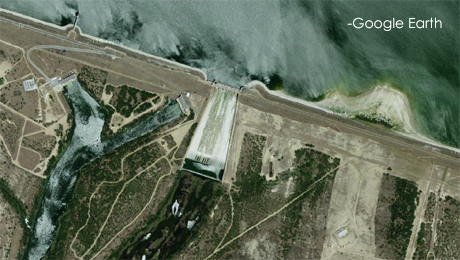 With relatively dry conditions prevailing in most of the Rio Grande basin, inflows to the dam have dropped considerably and the reservoir elevation is declining. However,scheduled releases from Mexican reservoirs that discharge into tributaries down-stream of Falcon Dam need to be marginally increased. The U.S and Mexican Sections of the International Boundary and Water Commission in conjunction with the National Weather service are collaborating on all releases to the Rio Grande. The reduced releases will improve conditions at some downstream communities. Further evaluations of the inflows to Falcon Dam will continue throughout the week for possible further reductions. Even with the reduced releases from Falcon Dam, residents down-stream should continue to monitor National Weather Service warnings and forecasts for updated information and river forecasts concerning flood conditions.